Perhaps the granddaddy of all pure B camper van rallies is in Pennsylvania this year May 16-18. It appears to be full but usually cancellations for various reasons everyone has gotten on the waiting list. We attended B-4 for our first. It started on RVnet.com but has been affiliated with them for several years. That's actually not far from me! What kind of events, etc will there be? It is strictly Class B. 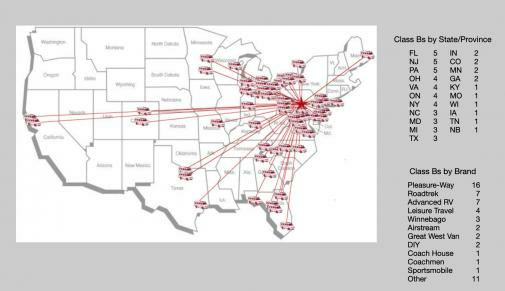 Here is a breakdown of where everyone is coming from and the vans represented. Notable people you may know are George Mauro of the Humble Road blog and Mike Neundorfer, CEO of Advanced RV. They are there as participants and not representing their businesses. We are setting up for a busy April and May first with a BEE (RV) Social near Columbus, IN, then Advanced Fest in Willoughby, OH and this B-rally in PA, interspersed with two Indy Car races in Indianapolis, the Indy Grand Prix and the Indy 500. I went one day last year as a visitor and with what I learned I bought our B in June and we are signed up to participate this year. Had a great time the one day I visited and everyone was very friendly and helpful.